Hope your memories are similarly tame. On Tuesday night, President Trump delivered his delayed State of the Union address to a joint session of Congress, in a lengthy 83-minute speech that included only a handful of proposals related to healthcare. The President again addressed the issue of rising drug prices, urging Congress to pass legislation that “delivers fairness and price transparency for patients,” while citing data that in 2018, drug prices “experienced their single largest decline in 46 years” as evidence that the Administration’s focus on pharmaceutical spending is already having an impact. Trump also urged Congress to force hospitals and insurance companies to disclose “real prices” to foster greater competition. Not coincidentally, these two areas of focus—drug pricing and healthcare transparency—have garnered the greatest interest as potential areas of bipartisan cooperation in healthcare, and bring some hope for legislative action in the new Congress. Both are issues that have seen a flurry of new regulatory proposals from the Trump administration, and the President seemed to be using the speech to build momentum for those efforts. President Trump also urged action on two major research initiatives, asking Congress to allocate $500M over the next ten years for pediatric cancer research, and setting the goal of eliminating the spread of HIV by 2030. Although the proposed new funding for childhood cancer research is relatively meager compared to earlier government cancer research campaigns, the additional spending was hailed by the pediatric oncology community as a helpful new investment that could jumpstart research on immunotherapy, targeted therapies, and other key areas. The President’s proposal on HIV represents an aggressive new strategy by the Federal government to dramatically reduce new infections by targeting key “hot spot” communities to encourage greater use of antiretroviral drugs to reduce HIV in those already infected, and to increase the use of pre-exposure prophylaxis drugs to prevent further spread. Two health policy phrases were notably absent from the President’s speech: “repeal and replace” and “Medicare for All”. Although the President again touted the landmark 2017 tax reform law for eliminating penalties associated with the individual insurance mandate, there was no further mention of dialing back the Affordable Care Act (ACA)—rather, the President declared it a “major priority” to “protect patients with pre-existing conditions”, a cornerstone of the ACA. Nor did the President directly address Democrats’ growing calls for “Medicare for All”, instead only vaguely alluding to “new calls to adopt socialism in our country.” Regardless of the lack of real estate given to the ongoing debate over coverage expansion in the President’s speech, it’s clear that coming months will witness a no-holds barred fight over the issue, with the 2020 Presidential election and the continuing Texas court battle over the constitutionality of the ACA providing impetus for both sides to engage. This week Dallas-based Baylor Scott & White Health and Houston-based Memorial Hermann announced in a brief joint statement that they would discontinue discussions about a proposed merger between the two systems. The potential deal, announced in October, would have created the largest health system in Texas and one of the ten largest nonprofit systems in the country, with 68 hospitals and nearly $15B in revenue. While there has been little public comment from leaders on either side about the stumbling blocks in negotiations, media have speculated that Memorial Hermann may not have been willing to stomach the degree of cost cutting laid out in the merger, and raised questions of incompatibility between the systems’ physician organizations and academic models. Other reports cited concerns about a “big brother, little brother” relationship dynamic between the two systems. Although board seats were slated to be evenly divided, the new organization was to be based in Dallas and led by Baylor CEO Jim Hinton, with the combined Office of the CEO weighted toward Baylor Scott & White leadership. Regardless of the specific reasons given for the breakup, all signs point to concerns over control and cultural fit, which would have created barriers in achieving the vision outlined by Hinton and Memorial Hermann CEO Chuck Stokes for a combined system that would deliver care that is convenient, affordable and consumer-centric. Some policy experts hailed the breakup as “a relief”, and a “step in the right direction for consumers”, citing historical evidence that hospital mergers have tended to raise prices and deliver little value to patients or purchasers. We disagree that health system mergers are incapable of creating value but acknowledge that few in the past have done so. Any merger on the scale of the one proposed by these systems must be held to a high standard for creating a more efficient, lower-cost, consumer-centered organization. But to achieve that, systems must pursue a degree of operational integration, streamlined leadership and cost-cutting that has not been a part of most health system combinations. If due diligence revealed conflicts that would impede that level of integration, the decision by these two Texas systems to remain separate was probably a good call. Four years after its state legislature mandated a major overhaul of its Medicaid program, North Carolina announced that it planned to award contracts valued at $6B per year to four managed care insurers and one payer-provider organization. Citing years of mismanagement and cost overruns, the 2015 legislation required North Carolina to move to a managed Medicaid framework, and contract with private organizations to manage the 2.1M enrollees in the state’s Medicaid program. The legislation envisioned two types of arrangements: traditional contracts with “prepaid health plans” (PHPs) of the sort commonly used in other states, and contracts with “provider-led entities” (PLEs), in which hospital systems and doctors could participate as joint owners. In moving to a managed Medicaid framework, North Carolina joins a large and growing majority of states that contract with private insurers to control the cost of care for low-income residents. Four PHPs were awarded state-wide contracts: AmeriHealth Caritas; Blue Cross Blue Shield of North Carolina (BCBS-NC); UnitedHealthcare; and WellCare. One PLE, Carolina Complete Health (a partnership between the North Carolina Medical Society and national insurer Centene Corp.), was awarded a regional contract covering two of the state’s six regions. The five entities will now begin to contract with hospitals and doctors to provide services for the 1.6M enrollees to be covered by managed Medicaid, leaving about 500K medically-complex Medicaid patients with traditional Medicaid coverage until a later date. Notably excluded from participation was My Health by Health Providers, a consortium of twelve major North Carolina health systems who have partnered with Presbyterian Healthcare Services, a New Mexico-based payer-provider organization with expertise in Medicaid managed care. That coalition was assembled in the wake of the reform legislation, and was widely expected to be included, given its extensive footprint across the state and the fact that it represents most of the major provider systems in North Carolina, positioning it as a prototypical provider-led entity. Another PLE, Optima Health (the health plan arm of Virginia-based Sentara Healthcare), was also excluded from the Medicaid award. We’re surprised by the relatively limited success of the payer-provider organizations in garnering Medicaid contracts. As proponents of provider-led approaches to risk, we were (tangentially) involved in offering input to legislators in North Carolina during the drafting of the legislation and were keen to see the evolution of the state’s Medicaid program to include PLEs. By heavily favoring traditional managed care insurers in its award, North Carolina’s Medicaid program seems to be signaling that it views providers as part of the problem, rather than part of the solution, in its effort to transform care. We certainly hope that’s not the case. Here’s a graphic that we first shared back in August, showing the Congressional Budget Office’s estimates for how much Medicare spending is expected to grow over the next ten years. We’ve recently updated it to include estimates for 2028 spending, and actual data for Medicare spending in 2018. The key takeaway from this data has not changed: the preponderance of spending, and spending growth, over the next decade will be driven by providers. You wouldn’t necessarily know that from listening to the recent rhetoric in Washington, where the dialogue has centered almost entirely on pharmaceutical spending. 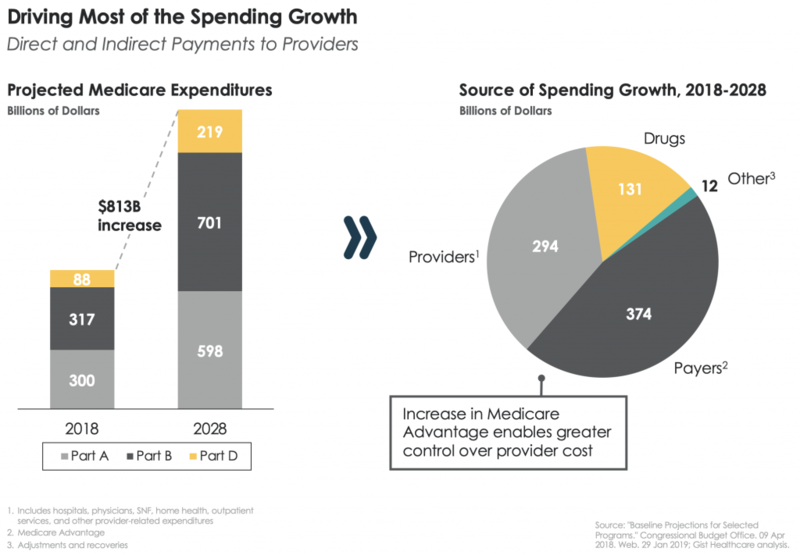 It’s certainly true that spending in Medicare Part D is going to grow substantially, and that some proportion of Medicare Part B spending also goes to cover drug costs (around 10 percent). But to address the over $800B in Medicare spending growth over the coming decade, we’re going to have to rein in growth in spending on hospitals, doctors, postacute providers, and others. The pie chart on the right indicates how that’s likely to happen—by funneling a growing portion of those dollars through Medicare Part C, private Medicare plans. As Medicare Advantage (MA) enrollment continues to grow as a percentage of total Medicare coverage, the government will increasingly look to private insurers to constrain the amount paid to providers, in a way that traditional Medicare is not equipped to do. That will provide a windfall opportunity for MA plans, but they would be well advised to recognize another lever this strategy presents to Federal budgeteers: constraining the “cap rate” paid to plans to manage Medicare enrollees. MA plans have largely paid providers at Medicare fee-for-service rates, and driven profitability on the spread between the “cap rate” and provider fees. But that profitability is likely to be squeezed as Federal budget realities dictate budget constraints on MA plans. That squeeze will reverberate down the chain to providers, who will have to learn to live on lower rates for caring for America’s seniors. 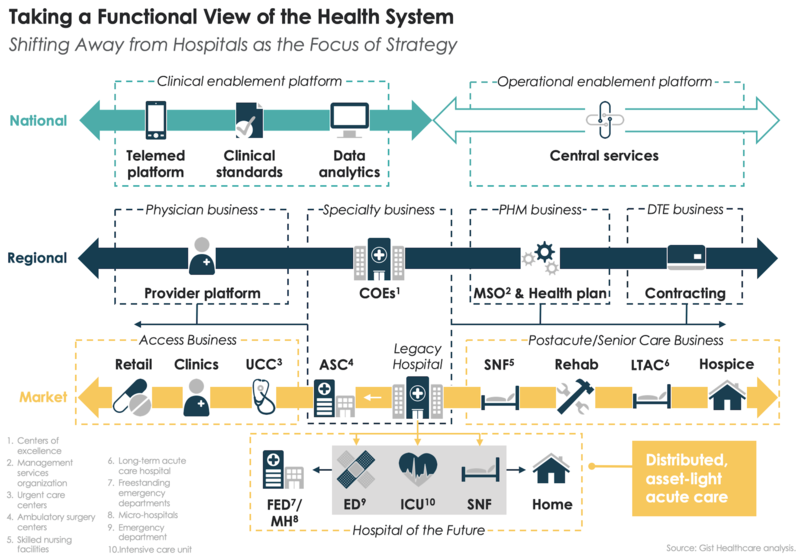 At a recent convening of leaders from across a large regional health system, I shared our framework for helping health systems rethink their approach to investing in delivery assets, built around a functional view of the enterprise. We discussed how they might apply our concept of the “health system of the future” to their planning, moving some specialized services “up” from local hospitals to market or regional centers of excellence, and taking lower-acuity care and basic access “out” from the hospital to convenient and virtual care settings. Leaders there realized that this vision would require investing in new businesses and care solutions that don’t exist today, such as the “senior-care business”, comprised of solutions to manage aging patients with multiple chronic conditions in non-hospital settings. 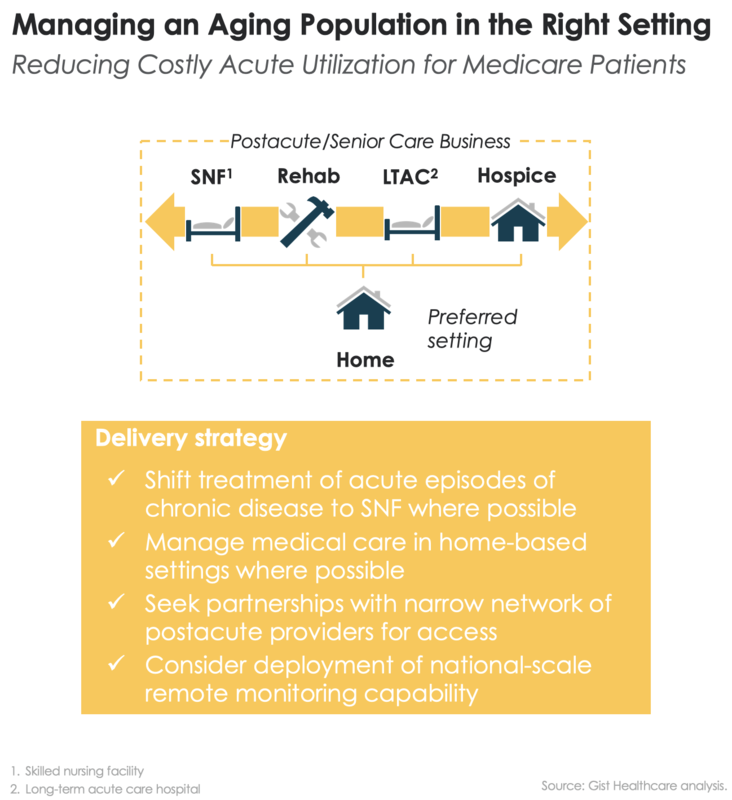 As we have described before, this includes a new vision for traditional postacute care, allowing for patients with chronic disease to be admitted directly to skilled nursing facilities, or even managed at home. It likely also includes a new vision for end-of-life care and hospice. After my presentation, a physician pulled me aside to discuss something he thought I had missed: “You mentioned hospice. But what about palliative care? Shouldn’t it have a big role in a senior care business?” He lamented how often this important set of care and social services gets lumped in with hospice, when it can have a tremendous impact for patients who are experiencing serious health care issues but aren’t terminally ill. Most patients, and many providers, think that to receive palliative care you have to discontinue lifesaving or curative treatment, and have a prognosis of six months or less to live. A growing number of studies have demonstrated that providing palliative care support while still allowing lifesaving treatment improves quality of life, decreases depression and family stress levels, lowers costs, and may actually improve lifespan. Payers are beginning to take notice. Aetna has been particularly progressive, piloting research and evolving policy to increase palliative care access. The doctor I spoke with described his vision for palliative care that plays a much broader role in managing patients who need supportive care for ongoing problems for which there is no expected cure, and where aggressive treatment may not be the best option. The conversation left me pondering all the factors that need to be addressed to enable a broader palliative care function: aligning payment and policy; developing clinical care pathways; investing in physician and patient education; developing health system capabilities; and managing public perception. Lots of work to do! This week I gave a “state of the industry” talk at the strategic planning retreat of a health system whom I’ve worked with for years. The retreat brought together executives and board members for two days of working sessions to kick off the preparation of the system’s next five-year plan. The system is on the smaller side, largely concentrated in one quadrant of a major metropolitan area but dwarfed by two other nonprofit hospital systems that dominate the market, and the regional division of a large for-profit chain. Traditionally, the system has viewed themselves as “Switzerland”, happy to leverage the fact that they’re “must-have” in most payer networks in their area, given their geographic position. They’ve largely pursued a patchwork of partnerships with the other players in the market, rather than fully aligning with any of their larger competitors. But the landscape has changed significantly since the last plan was assembled four years ago. The community hospital systems have both continued to grow by acquiring more hospitals in outlying areas, and have pursued aggressive vertical integration strategies to build robust physician networks. The for-profit chain is targeting the market for investment. And disruptors have begun to encroach on the market as well, with health plans and private investors snatching up physician and ambulatory assets, and digital medicine startups launching new, consumer-oriented service offerings. The system has struggled to keep pace. While they’ve been able to maintain their “must-have” position in payer networks and have made strides in cost reduction and built a solid reputation in a handful of key service lines, they’re not growing as fast as they’d like. Moreover, they’re feeling increasingly surrounded by their larger, better-capitalized competitors. The key question they face: how much longer can they continue to play the Switzerland strategy? It’s a conundrum we’ve seen at other, similar systems: weighing the trade-off between maintaining independence and pursuing alignment strategies (up to and including being acquired) that can enable the next phase of growth. “If you’re not growing, you’re dying,” is the mantra of the system’s CEO—but where will growth come from? No easy answers here, but in general our perspective is that systems like this should focus heavily on providing outstanding value in their existing business, to set themselves up for partnership opportunities that allow them to dictate any eventual terms of alignment. My guess? The Switzerland-style systems in many markets will either come together in some kind of “non-aligned pact” or will find themselves part of larger regional or national systems sooner or later. Music we think you’ll love as much as we do. We don’t live in Jersey City, and chances are you don’t either. But on Friday nights after the Weekly Gist has been put to bed, we like to tune in to the hottest hour of radio in America, broadcast live on WFMU in Jersey City and available around the world at wfmu.org. There, for more than 20 years, the 8pm shift has been home to Downtown Soulville, an hour-long tour of vintage soul and funk 45s from the vast collection—over 20,000 singles!—of legendary host Mr. Fine Wine. That’s the DJ name of Matt Weingarten, a Brooklynite crate-digger who’s been collecting rare 45s for years, and whose weekly shows are a graduate-level course in getting your groove on. You won’t hear the oldies canon that passes for variety on most radio stations—instead, Mr. Fine Wine brings you the hidden nuggets and obscure gems of 60s and 70s soul. Take last week’s lineup, which included singles from Flair & the Flat Foots, The Adorables, Dee Dee Barnes, The Dynamics, and Melba Moore. The show is available to stream live, or to download in podcast form—the perfect hour of music for your transition into weekend mode. And if you find yourself in New York City with a free Wednesday night, swing by Botanica Bar (itself a legend—it’s the old Knitting Factory), where Mr. Fine Wine has been spinning 45s for the past 23 years. While you’re at it, you should really take a spin around some of the other incredible shows available at WFMU. It’s the nation’s oldest freeform radio station, and the variety of great content is mind-blowing—”college radio” at its finest. Personal favorites: Music to Spazz By (eclectic vintage rock); Reggae Schoolroom (the finest Rasta music); and Burn it Down! (punk and more). Or just tune in to their livestream anytime—you’re sure to hear something amazing. We’ve long known about the tsunami of rising health care costs that will swallow the Federal budget as the Baby Boomers join the Medicare program. A study in this month’s Health Affairs provides the most optimistic analysis we’ve seen that we may be gaining ground in reducing the cost of care for the elderly—and sheds light on the underlying care improvements that have helped lower spending growth. Researchers examined medical spending data for patients in the Medicare Current Beneficiary Survey from 1999 to 2012, and found a downward inflection point in actual vs. predicted spending around 2004 that has persisted since. By 2012, per-capita spending was $2,899, or 14 percent lower than predicted. Researchers then examined the drivers of spending slowdown. They ruled out common market and demographic wisdom (slower growth was not due to the Great Recession, as spending reduction persisted during the recovery, nor was it caused by enrollment growth of younger beneficiaries). By far the greatest contributor to lower spending growth was found to be innovations in cardiovascular and cerebrovascular care, which together accounted for a whopping 56 percent of the spending slowdown. (Significant reductions were also seen in dementia and renal care, while cancer care spending growth rose.) What accounts for the slower growth in spending on stroke and heart care? While great improvements have been made in management of acute events, investigators found that over half of the reduction came from better control of hypertension, high cholesterol and diabetes—demonstrating that prevention can have a significant spending impact at the level of the overall Medicare population. An important factor contributing to better disease management was the expansion of the Medicare drug benefit in 2006, which widened access to key therapies, coupled with the fact that several important medications “went generic” over the past fifteen years. Looking forward, there should be further room to push prevention, since still fewer than 60 percent of people have their cardiac risk factors under control. Doctors and health systems should view these results as confirmation that the hard work of care management and preventive care pays real dividends, and as motivation for a business model that is built around incentives for keeping patients well—which will be even more critical as Baby Boomers swell the ranks of Medicare beneficiaries. There’s been a flood of articles about hospital pricing since the Federal rule requiring hospitals to post their prices went into effect, and we were floored by this Kaiser Health News analysis of the variability of hospital chargemaster prices for common services—which found huge variability in prices not only across markets, but between hospitals just miles from each other. To get a sense of it, click through and take a look at the graphics assembled by the Kaiser team. Some of the numbers have been reported before: charges for a brain MRI with contrast varied from $1,721 at the University of Minnesota to $8,793 at Cedars-Sinai Medical Center in Los Angeles. But linger for a moment on the variability in charges for a liter of IV fluid in Los Angeles, which ranged from $146 at Children’s Hospital of Los Angeles to $383 at Cedars. In general, the comparatively high charge rates were reported by marquee academic institutions. Given that these systems are often considered “must-have” in networks, it’s likely they have leverage to negotiate a higher percent of charges as well—a double-whammy in boosting the actual price paid. Of course, no patient or payer pays the charge rates that are reported here. And we know there is a lot of cost-shifting that occurs between services in the chargemaster. But try explaining to a patient why the “price” of one of the simplest items a hospital provides—a bag of IV saline administered by a nurse—could be 260 percent higher at one hospital than at another less than seven miles away. Consumers will not have the patience or knowledge to understand the nuances of hospital billing and contracting practices. As efforts to force more transparency into pricing gain momentum, consumers will be getting a glimpse at healthcare at its worst: a tangle of inexplicable variability and obscenely high prices. Good luck explaining how chargemasters work. Since 2016, Boston-area consumers have been able to ask Alexa what they should do when their child has a rash or a fever, thanks to the KidsMD app, built through a partnership between Amazon and Boston Children’s Hospital. While consumer use of this and other voice-assistant delivered care products has been spotty, a recent STAT article caught our eye by describing how health systems across the country are expanding the use of artificial intelligence (AI)-driven voice assistants inside the hospital. The inpatient applications are far-reaching, including patient education, staff preparation prior to surgery, and direct patient access to their health record information. Most promising may be using Alexa as a replacement for a nurse call button, enabling the technology to respond to simple requests and triage to appropriate staff. The spread of these uses signals an expansion in the use of voice technology from basic consumer-centered applications toward solutions embedded in the process of care delivery. In contrast to consumer-focused applications, which focus on clinical guidance (and may raise concerns about accuracy and liability), many hospital applications are operational in nature, aiming to simplify processes and reduce staff time spent on mundane tasks. Patients may also be more willing to engage with virtual assistants than previously thought, with research showing that some patients are more receptive to revealing personal habits or posing “embarrassing” questions to Alexa than to their provider. But the greatest long-term impact of voice technology may be in reducing labor cost, with virtual assistants and AI algorithms providing a solution that is both cheaper and more efficient than the same service provided by human staff members. Undoubtedly, this will create a thicket of issues regarding staffing and labor relations that will only grow as the use of AI solutions expands. Thanks for reading the Weekly Gist! We appreciate you taking time to hear our thoughts on what’s going on in healthcare, and we’d love to hear yours! Whether you read it right away, over the weekend, or when you get back to the office on Monday, please get in touch and let us know your perspectives as well, along with feedback and suggestions. And don’t forget to forward this to a friend or colleague and encourage them to subscribe! Most of all, we hope you’ll let us know if we can support you in your daily work. You’re making healthcare better—we want to help!